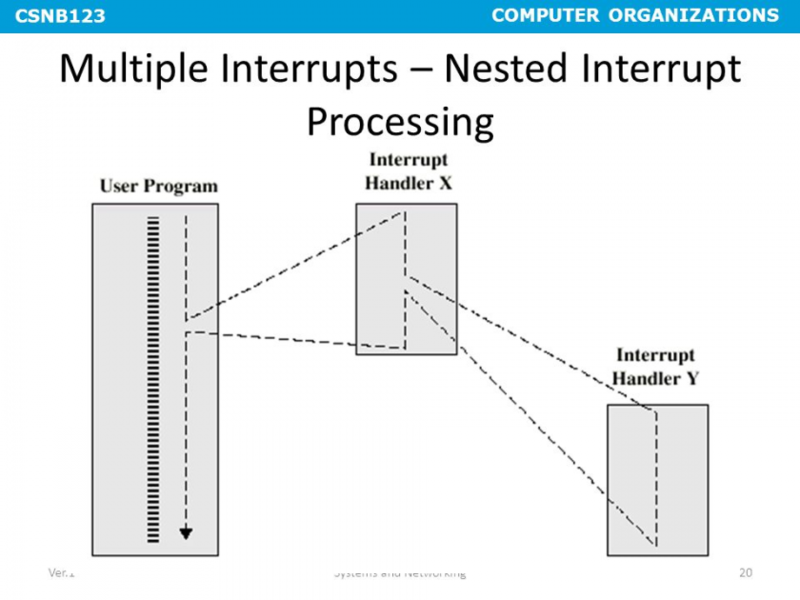 This tutorial demonstrates how to use interrupts on a processor. In general, you will understand the concept behind interrupts on any processor, but we will use the SJ-One board as an example. An interrupt is the hardware capability of a CPU to break the normal flow of software to attend an urgent request. The science behind interrupts lies in the hardware that allows the CPU to be interrupted. Each peripheral in a microcontroller may be able to assert an interrupt to the CPU core, and then the CPU core would jump to the corresponding interrupt service routine (ISR) to service the interrupt. On some processors, the savings and restoring of registers is a manual step and the compiler would help you do it. You can google "GCC interrupt attribute" to study this topic further. On SJ-One board, which uses LPC17xx (ARM Cortex M3), this step is automatically taken care of by the CPU hardware. The number of interrupts implemented is device dependent. A programmable priority level for each interrupt. A higher level corresponds to a lower priority, so level 0 is the highest interrupt priority. This means that interrupts of the same priority are grouped together and do not preempt each other. 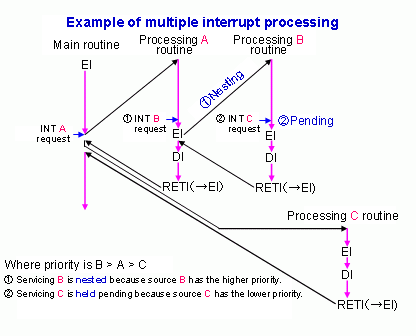 Each interrupt also has a sub-priority field which is used to figure out the run order of pending interrupts of the same priority. This enables back-to-back interrupt processing without the overhead of state saving and restoration between interrupts. This saves us from the step of having to restore and then save the registers again. Now that we understand how the CPU hardware services interrupts, we need to define how we inform the CPU WHERE our ISR function is located at. 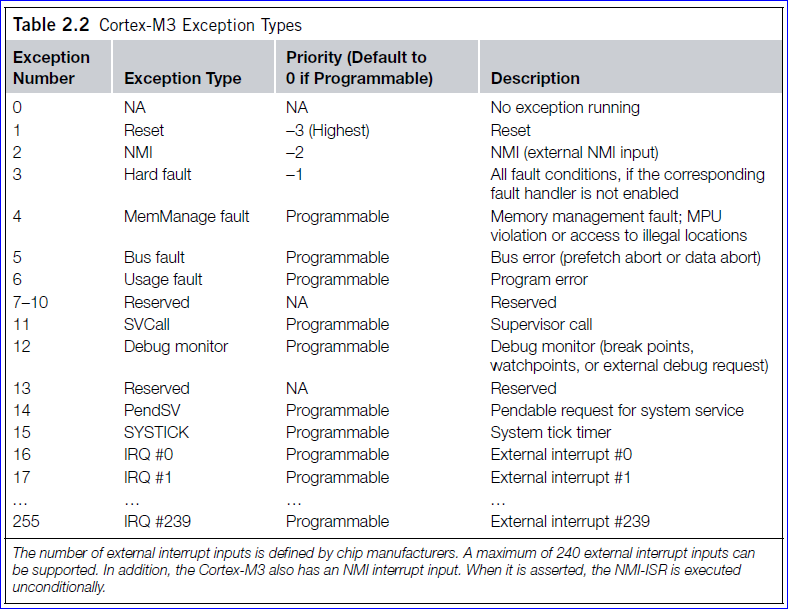 This table is nothing but addresses of functions that correspond to the microcontroller interrupts. Specific interrupts use specific "slots" in this table, and we have to populate these spots with our software functions that service the interrupts. The using a linker script and compiler directives (commands for the compiler), the compiler is able to place the software interrupt vector table at a specific location that the CPU expects the interrupt vector table to be located at. This connects the dots about how the CPU is able to determine WHERE your interrupt service routines are located at. From there on, anytime a specific interrupt occurs, the CPU is able to fetch the address and make the JUMP. * location by using the linker script that will place it at the isr_vector location. * CPU loads the stack pointer and begins execution from Reset vector. NOTE: that a vector table is really just a lookup table that hardware utilizes. All of the methods require that you run this function to allow the NVIC to accept a particular interrupt request. Where the input is the IRQ number. This can be found in the LCP17xx.h file. Search for enum IRQn. DO NOT DO THIS, unless you really know what you are doing. The ISR forwarder works with FreeRTOS to distinguish CPU utilization between ISRs and tasks. I highly discourage modifying the startup.cpp and modifying the vector tables directly. Its not dynamic is less manageable in that, if you switch projects and the ISR doesn't exist, the compiler will through an error. The EINT3_IRQn symbol is defined in an enumeration in LPC17xx.h. All you need to do is specify the IRQ number and the function you want to act as an ISR. This will then swap out the previous ISR with your function. This is the best option! Please use this option almost always! * Find the IRQ number for the interrupt you want to define. Can dynamically change ISR during runtime. Does not disturb core library files in the process of adding/changing ISRs. Always try to prevent changes to the core libraries. Does not cause compiler errors. Your ISR cpu utilization is tracked. Interrupt events could happen before main begins. Do very little inside an ISR. When you are inside an ISR, the whole system is blocked (other than higher priority interrupts). If you spend too much time inside the ISR, then you are destroying the real-time operating system principle and everything gets clogged. DO NOT POLL FOR ANYTHING! Try to keep loops as small as possible. Note that printing data over UART can freeze the entire system, including the RTOS for that duration. For instance, printing 4 chars may take 1ms at 38400bps. If you are using FreeRTOS API, you must use FromISR functions only! If a FromISR function does not exist, then don't use that API. Clear the source of the interrupt. For example, if interrupt was for rising edge of a pin, clear the "rising edge" bit such that you will not re-enter into the same interrupt function. If you don't do this, your interrupt will get stuck in an infinite ISR call loop. For the Port interrupts, this can be done by writing to the IntClr registers. It is a popular scheme to have an ISR quickly exit, and then resume a task or thread to process the event. For example, if we wanted to write a file upon a button press, we don't want to do that inside an ISR because it would take too long and block the system. What we can utilize a wait on semaphore design pattern.